Wednesday, 20 March 2019, 5:23p.m. 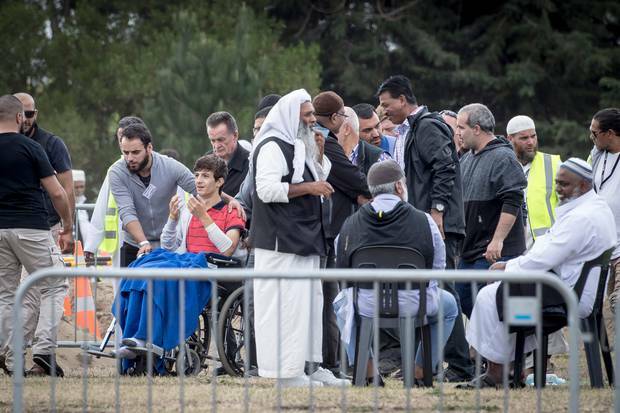 Two more shooting victims are about to be buried in Christchurch in the second set of funerals for the attack victims. Their bodies are en route to the Memorial Park Cemetery, where several hundred people are in the cemetery waiting for the service to start. One of the victims being buried has name suppression. He is the only man the gunman has been charged with murdering so far. It is understood the other victim being buried now. Earler, the bodies of Khaled Mustafa and his teenage son Hamza were laid to rest. The pair were the first of the 50 Christchurch terror victims to be laid to rest at a funeral service in the city's east today. Kahled was 44 and Hamza - his eldest child - just 16. His younger son, Zaid, 13, was also badly injured when a gunman stormed into the Al Noor mosque on Friday - opening fire indiscriminately at worshippers. Hundreds of men, women and children had been gathering in the hour leading up to the service - some hugged, others reflected. So, instead of a mosque was a marquee. Instead of privacy to farewell and mourn, the world's media had been invited today and were watching from across the road. 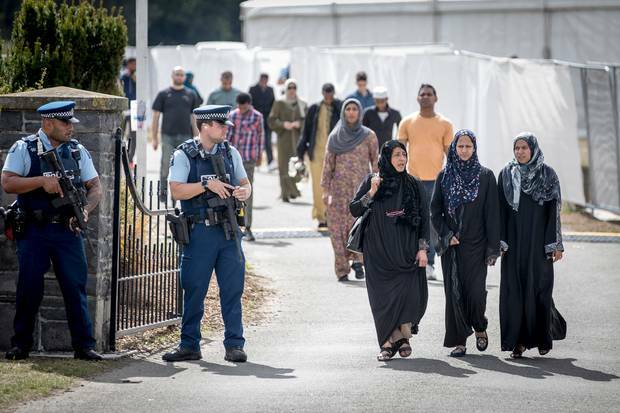 Kahled and Hazma began their final journey today at a Christchurch funeral home, then they were carried in a white van escorted by police, across the city they loved and called home, to their final resting place. The men moved inside, the women remained in a separate area as per custom. A solemn voice came across a specially-erected PA system, issuing instructions to the mourners whose number grew by the minute. An evacuation plan was also in place - a grim reminder of what has happened in the southern city which is still on high alert. Mourners were then reminded that it was not a traditional funeral and the things they would usually do to assist the families and bury the dead may not be appropriate in the current setting. "Our number one priority is the families," said the voice, ringing out across the cemetery. "This is all about the families... they need a chance to grieve. "I know everyone is here to help... we are all here to pay our respects to those who have fallen." The voice urged mourners to stay calm and respect what the families wanted - even if they wanted to help and follow the usual protocols, which were not possible today. After the bodies were taken inside and positioned as per Muslim custom, the Salat al-Janazah (funeral prayers) began. Kahled and Hazma were flanked by their family as their community surrounded them in numbers to send them off. The silence was heavy, the air still and the magnitude of the grief and tragedy not lost on anyone present. While it is acceptable in Islam to express grief over death by crying and weeping - "wailing and shrieking, tearing of clothing and breaking of objects, and expressing a lack of faith in Allah are all prohibited". "It is a very special moment, a very moving moment," said another man over the PA. He called on his brothers to line up, to pray. Everyone else present, gathered in unity under the overcast Christchurch sky was no doubt doing the same in their own way. As the brothers faced qiblah - Mecca - and prayed, the words 'Allahu Akbar' rang out over the PA, breaking the silence. Four times it rang out. Allahu Akbar. Allahu Akbar. Allahu Akbar. Allahu Akbar. "God is greatest". Then, it was time to place Kahled and Hazma in their graves. Mounds of dirt from lines of graves specially dug this week were visible from the road - a sight no one in Christchurch could ever imagine they would see. It is a city used to burying its dead, and on mass - but no amount of fatal quakes could have prepared them for the shootings. Kahled and Hazma were carried by those who loved them most across the dusty landscape and lowered into their graves. Those placing the body in the graves recited "Bismillah wa ala millati rasulilllah" or "in the name of Allah and in the faith of the Messenger of Allah". Once laid to rest, a layer of wood or stones is placed on top of it to prevent the bodies coming into direct contact with the soil that will fill the grave. Those who wanted to filed past, dropping in handfuls of soil and paying their last respect. Kahled and Hazma were buried as they died - together. But today they lay in peace - with no fear, evil or terror. Andrew Dickens: Today is the first day of the rest of your life!